"INCREDIBLE REPORTS BY CREDIBLE WITNESSES. . ."
WHAT do we make of the thousands of incredible reports of anomalous aerial phenomenon made by highly oftentimes qualified, highly competent, and credible witnesses- including a world famous astronomer?. Even, if assuming, that 99.99 percent of these reports get to be reasonably and factually explained away as simply misidentification of normally natural objects, again WHAT do we make of the remaining 00.01 percent that has truly got the authorities stumped for such an explanation? It seems that in this case, while man has been endowed with the divine instincts and intellectual capacity to satisfy his curiosity in order to be able to discover and find out what makes the physical world around him "tick", yet when confronted with the anomalous and the truly unusual and un-earthly phenomenon, he seems to be reeling back in fear of what is truly the more perplexing and highly intriguing UNKNOWN that could only come from beyond the realm of imagination. . . Apparently we may have discovered what other things the usual "weather" for the day can also do!. . . indeed, an "unusual weather-induced mechanism" can not only halt and delay air traffic- it can also make "perfectly circular holes" in the clouds. . . 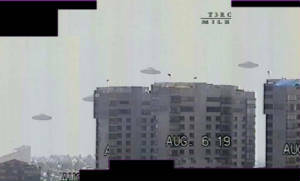 The photo mosaic at the right, is part of a video footage showing what appears to be a slowly rotating, obviously circular-looking "classical saucer-shaped" object that was reported to have been sighted over Mexico City in August of1997. While we can not proclaim any authenticity on this particular document, some aspects of what the footage shows makes us stop on our tracks to "re-think", and ask ourselves such questions as: if this was a fake, how'd they make it go on the other side of the building?. . . how'd they make it seem to "rotate" on its axis (if any)?. . . . but then, again, this could also be another case of the saying that if something seems "too good to be true", it probably is. Have Astronomers Also Observed "UFOs"? . . .